The naysayers were quick to grumble when “another pizza restaurant” opened in Cowgate in September last year. But four months on The Pizza Parlour and Music Cafe, to give it its full title, is going from strength to strength - hardly surprising if my visit on Saturday was anything to go by. Brad Barnes has lunch at the Pizza Parlour and Music Cafe in Cowgate, Peterborough. 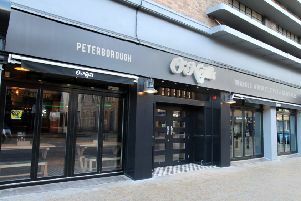 Yes, it sits on a city centre street dubbed Pizzagate, alongside the established indies Pizza House and Topo Gigio’s plus national chain Prezzo. But, having eaten in all of them, they all offer something slightly different - and are all worth a visit. Pizza Parlour’s USP is the music, and I did tap my feet along with a fantastic swinging sixties, soul and Motown groove (going a step further there is also live music on Sunday and Monday). The walls lined with memorabilia from the decade add to the feelgood factor and the service was very friendly and helpful. What did surprise me, if I am honest, is how child friendly the place is, very accommodating given the grown-up “theme”. High chairs and buggy parking is no problem and there is a nice selection on the children’s menu, a choice of pasta dishes or pizza, a drink and ice cream to finish (£5.95). There is even a colouring competition to boot. In keeping with the competition, there is a lunchtime offer - £6 for half a pizza or pasta with a side dish, although I chose from the main menu. First up: calamari fritti (£5.95), which has become something of a favourite. The portion was plentiful, nicely cooked, the coating had a little flavour and nice texture and it came with a delicious home-made tartare sauce on a bed of rocket. Absolutely lovely starter. There were plenty of mouth-watering dishes on the pasta menu, not to mention steak and chips, but as the place prides itself on its wood-burning pizza oven and its sourdough - which is just how I like mine cooked - it was a no brainer. My choice, eventually, was the Toscanna (£9.95) boasting Italian sausage, bacon and pepperoni. It certainly delivered; no sogginess but not too crispy around the edge and it was as fully loaded as any pizza I have had in a long time. There were hints of sausage and salty bacon but the flavour was dominated by the pepperoni. A real delight - the only disappointment was I couldn’t finish it, in part down to the portion of chips, tossed in rosemary, fennel and salt ( a little price at £3.75). The two girls did their best to devour huge portions of spaghetti bolognese and cheese and ham pizza but still found room for two scoops of ice cream. Funny that. A very pleasant experience indeed, small but comfortable, and the bill - £35 - would have been much less had I made the same selection from the lunchtime menu.